"The military uses artists in a variety of roles. Most create recruiting posters, maps and diagrams, and animation for interactive military-training software, but some also produce combat art. Those soldiers will go into the field with a platoon, drawing and painting scenes of military life." 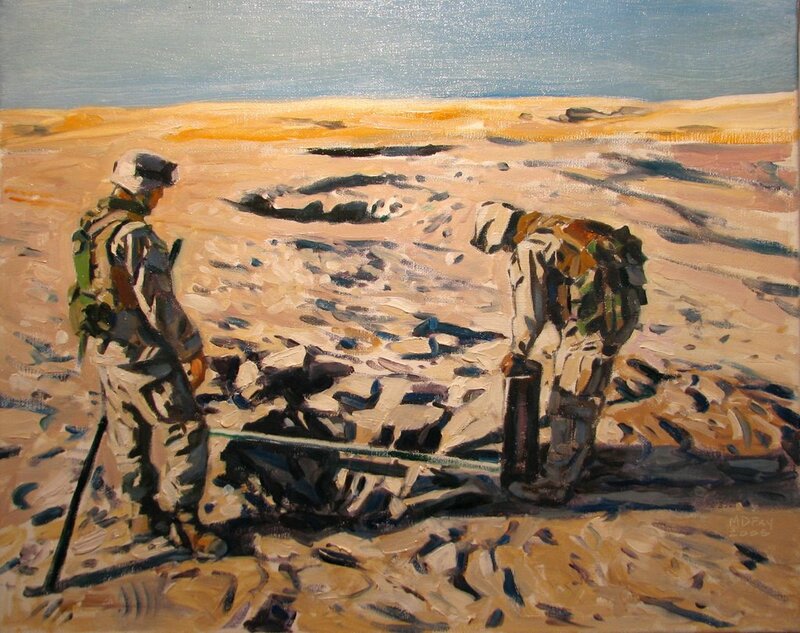 A quick search on the Google took me to the blog of Michael Fay, who describes himself as "one of three combat artists for the United States Marine Corps." His blog (http://mdfay.blogspot.com/) features work, in various stages, that he has done in the field. His paintings evoke for me the kind of 19-century painting done by the French artists accompanying Napoleon on the Nile. (There is currently an exhibition on this French art at the Dahesh Museum in New York.) It's a wonderful surprise to know that the Military is supporting this kind of reflection on their work.